I worked on this recipe last week and was so happy with how it turned out. I love chili (especially in the fall & winter) because it’s typically easy to make, filling and leaves lots leftover for lunches and more dinners throughout the week. I also like it on nights where my husband is working late because I can leave it simmering and don’t have to wait on him to eat dinner at my normal time. I generally prefer meatless chili while my husband’s philosophy is more meat makes everything better. This chili satisfied us both… it’s vegan which I love but the quinoa added enough texture and weight that my husband loved it too. 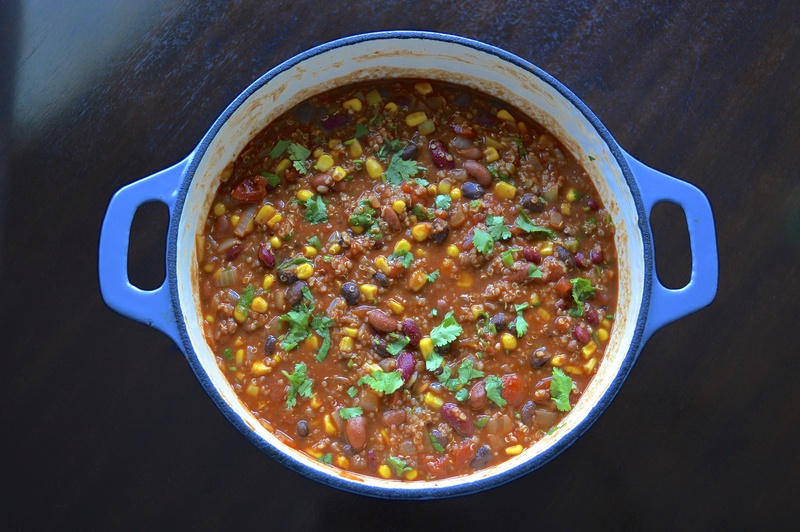 This makes a TON of chili… easily 8 huge servings but closer to 10-12 normal servings! 1. Heat 2 tbsp of olive oil in a heavy bottomed pot or dutch oven over medium high heat. Once it’s hot, stir in 6 cloves minced garlic and a pinch of red pepper flakes and stir until fragrant, about 30 seconds. This seems like a lot of garlic but this makes so much chili, I promise you it’s not! 2. Add in 2 chopped medium white onions and one chopped green bell pepper, cook until softened while stirring for about 4 minutes. We had some hot peppers from my husband’s coworker so we used those for some added heat, you could also use a red bell pepper! 3. Add 2 tbsp chili powder, 1 tsp cayenne (1 tbsp if you like heat! ), 1 1/2 tbsp cumin, 1 tbsp cocoa powder, 1 tsp paprika and 1/2 tsp salt & pepper. Stir well to combine. 4. Drain the liquid from a 28 oz can of diced tomatoes and add just the tomatoes to the pot along with 2c vegetable stock and a 15 ounce can of tomato sauce. Bring the liquids to a boil then reduce to a simmer. 5. Next, stir in 1 can rinsed dark kidney beans, 1 can rinsed light kidney beans, 1 can rinsed black beans and two cups of fresh corn. I like to use the dark kidney beans because you can get them with no added salt which cuts down on the sodium. Simmer for 30 minutes. 6. While the chili is simmering, you can cook your quinoa. We buy ours in the bulk section of the organic part of our grocery store which means it’s unprocessed and since quinoa is naturally coated with a bitter tasting insect deterrent, you want to make sure you wash it well. Put 1 cup quinoa in a fine mesh sieve, submerge it in a bowl of cold water and stir it around. Pour off the water and refill, then continue this until the water is no longer cloudy. Place the rinsed quinoa and 1 1/2 cups water in a small saucepan with a generous punch of salt. Bring to a boil, reduce to a simmer, cover and cook until quinoa is tender and the water is absorbed, about 15-20 minutes. 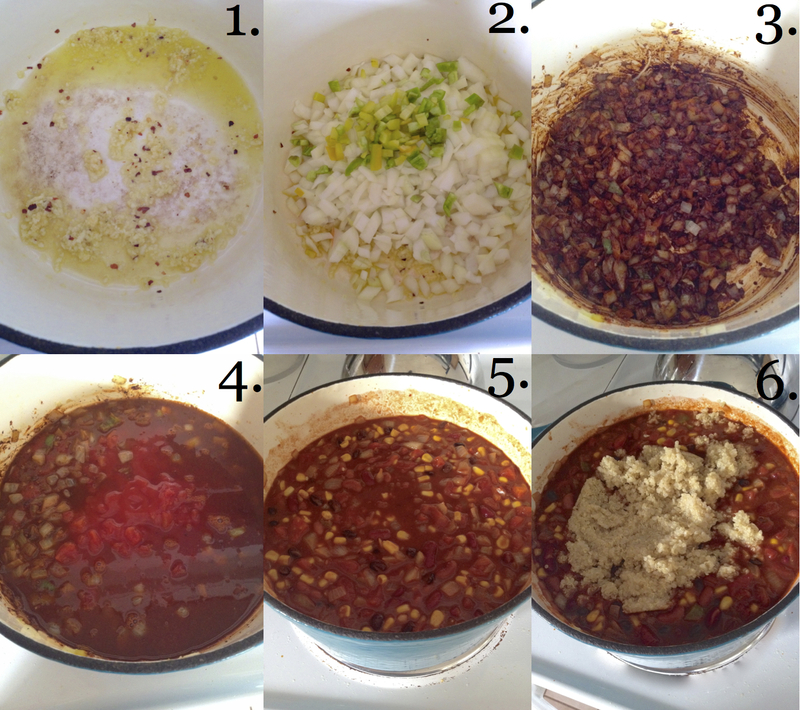 Once it’s cooked and your chili has finished simmering, fold the cooked quinoa into the chili. Just before serving, stir in the juice of one fresh lime and 3/4 cup chopped fresh cilantro. Recipe adapted from Cooking Classy, found here. I was just looking for something new I could make and freeze – this looks like a winner! Thanks! It’s a Martha Stewart dutch oven that my mom bought us years ago… it’s incredible, such a great thing to have in the kitchen for things like this! This looks really good! I have a question though… why do you put cocoa powder in? Thanks! The cocoa powder just adds another layer of flavor. With all the heat from the other spices this will give it a deep, slightly sweet note to the chili that really pulls it all together! Looks amazing and I can’t wait to try it! So happy that you made and enjoyed this as much as we do!! It’s so yummy and like you said it freezes so well which is good because it makes a TON!